Since the birth of space flight in 1957, the number of man-made objects orbiting the Earth has grown every year. There are now more than 15,000 such objects larger than 10cm, at least those that we know of. Even very small particles can pose a risk to spacecraft, because of the high relative velocities at which they travel. Not only can space debris affect critical equipment such as communications satellites, but it can also endanger manned space flights. A dramatic illustration of the dangers of space debris is given in the film "Gravity". It may have taken some artistic license with science to craft a good story, but its main premise is plausible. What Gravity showed was the worst case scenario, known as the Kessler syndrome, where a collision between two objects generates a cloud of smaller debris, which triggers a chain reaction of further catastrophic collisions, thereby rapidly increasing the amount of debris. This could make the low Earth orbit unusable for spacecrafts. Most of those are useless fragments of once-useful objects, which were created by explosions, collisions or missile tests. For instance, an accidental collision between the Iridium-33 and Kosmos-2251 satellites in 2009 caused them to shatter into 2,200 (recorded) fragments. Smaller space debris is much harder to track, but NASA estimates that up to 500,000 objects larger than 1cm, and 135 million particles over 1mm in size may now be orbiting the Earth. Space debris is becoming a serious issue, and many space agencies have started working on solutions. One approach being taken by JAXA, Japan's space agency, is to use a magnetically charged 700m-wide net made from aluminium and steel wires. If used at the right height it will attract floating space debris to it. When enough has been caught, the system can be ordered to fall out of its orbit back to Earth. During that process the debris, along with the net, will burn up as it enters Earth's dense atmosphere. JAXA will be doing a test launch of the system next month. The other approach is to remove existing inactive satellites from orbit. A prime target for this experiment would be the European ENVISAT satellite which stopped functioning in 2012 and now drifts uncontrolled in orbit. At an altitude of 800km and with mass of more than 8,000kg, the ENVISAT satellite would take more than 150 years to deorbit – that is, drop out of its orbit – naturally. 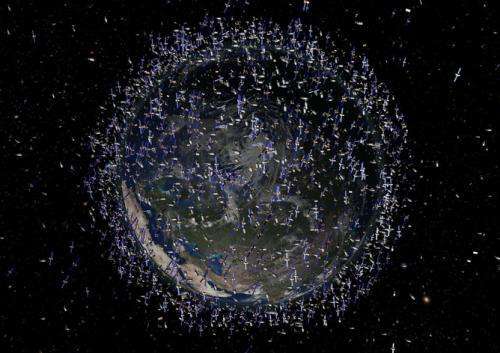 Throughout that time the satellite would be at risk of colliding with other objects and generating further debris. A more sustainable solution is to remove future satellites from orbit after they have served their purpose, thereby mitigating the growth of the amount of space debris. This is why international guidelines have been proposed which will restrict post-mission deorbiting time to 25 years for all new satellites. A gossamer sail deorbiting system deployed from a host satellite. The 5×5 m square sail consists of four quadrants which are supported and tensioned by four diagonal deployable masts. Most satellites designed today take will take longer to deorbit, and new technical solutions are necessary to meet the guidelines. 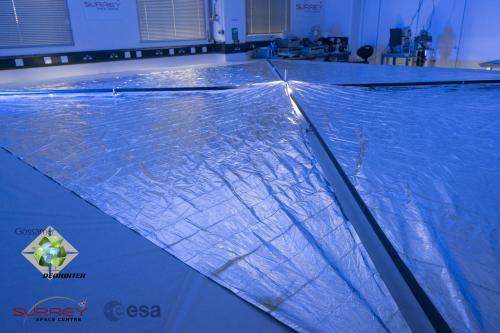 This is where Surrey Space Centre (SSC) working with the European Space Agency (ESA) have developed a Gossamer Sail for Satellite Deorbiting. The idea is to attach a large and very light, or gossamer, sail to a satellite, which can be deployed after its mission is over. The lower Earth orbit has some atmosphere, which enables the large sail to generate enough aerodynamic drag to slow down and deorbit the satellite more rapidly. Unlike existing deorbiting systems based on chemical or electrical propulsion, the gossamer sail system is relatively simple and does not require propellant or electrical power throughout its deorbiting phase. 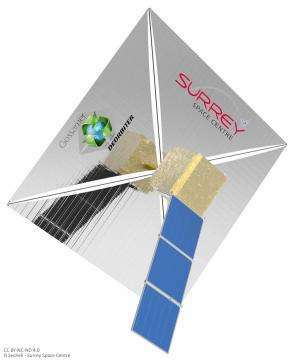 The gossamer sail after a deployment test at the Surrey Space Centre. The gossamer deorbiting system is designed to automatically orient the sail in the direction where maximum drag can be achieved, ensuring quicker deorbiting. Furthermore, the sail is made reflective, which allows it to make use of the solar radiation pressure to manoeuvre; solar sailing, so to speak. This enables the satellite to be lowered to an orbit where the aerodynamic drag takes over, allowing the satellites to be placed in higher orbits and still meet the deorbiting requirements. Developing and testing the SSC gossamer deorbiting sail was quite an engineering challenge. The 5×5m sail and the four deployable masts that support it have to be packaged inside a space measuring approximately 10×10×20cm. To achieve this, the sail is made of an ultra-thin membrane and the special carbon-fibre masts can be coiled up tightly (much like a tape measure). The SSC gossamer sail is expected to be tested within the next year. After the technology has been successfully demonstrated in space, the system can then be fitted to much larger satellites as an end-of-life deorbiting system. This will provide satellite operators with a means to meet the 25-year deorbiting guidelines, which in turn will help safeguard the possibility of space flight for future generations. This 'problem' might actually help to jump-start commercial space operations, since it is likely that we will eventually contract out to a private firm for cleanup work. In the future, there's going to need to be some way of charging cleanup costs back to the responsible parties, as more and more parties start to use space. I've discussed this before, along with other related topics of regulations and laws in space. I think, once again, that our existing maritime laws will work as a good framework for similar laws in space. For example, the cost and responsibility of cleaning up a shipwreck goes to the operator of the ship. Space will eventually be governed in some similar way. People may worry about countries like Iran or North Korea gaining the ability to launch missiles, but it wouldn't be good for us if they gain the ability to shoot down our satellites either. 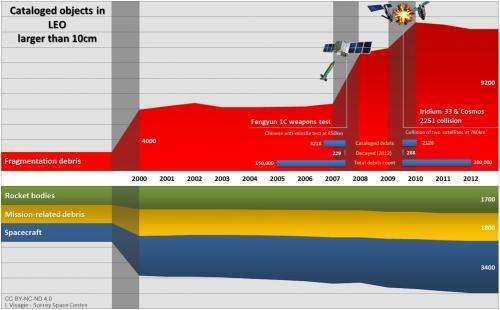 Space terrorism would be very hard to stop. Who would pay for it? More to the point: who would MAKE them pay for it? It's impossible to say which specific bolt/piece of scrap metal in orbit belongs to what agency. Unless some international fund is created that would pay for 'general removal'. But the type of international politics needed for that: can you see all relevant nations agreeing to that? Yes, but those come with a whole pile of engineering challenges we haven't solved yet. The sail idea mentioned here is much simpler and probably a lot more robust and reliable. Keep in mind that they are looking for something small and light. Those electric tethers need some kind of hardware that converts the voltage into momentum, such as an electron emitter/gun. Those systems are prone to contamination, and so would not be good to keep in hibernation mode while you're waiting for the end of the life of a satellite. The tether itself is prone to damage as well. A sail could still function with any number of pin holes through it. I'm assuming that the risk will outweigh the cost at some point, at which time major operators or their insurance companies will find it in their best interest to fund some cleanup work. Just to be clear; you mentioned bolts, but that's not realistic. I'm just thinking of larger, perhaps even salvageable equipment.